I am often asked how many attempts I make on my DIY projects or whether I’ve created any major DIY fails. The answer is, OF COURSE! Sometimes I think I have a great idea in my head but when I actually start my DIY creation, it turns into a disaster or a total fail. However, I generally won’t give up and I’ll attempt it a couple more times before I get it right. As you know, practice makes perfect! As a DIY-er, crafter, creator, or artist, I think it is so important to make attempts and experiment with ideas that may or may not work. 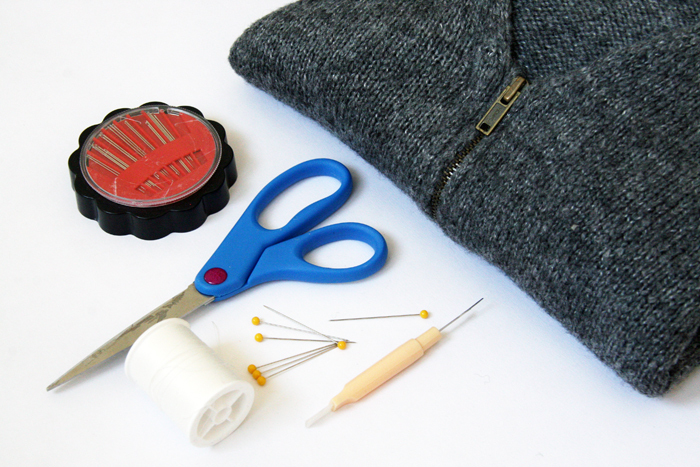 Which is a nice to lead into today’s DIY sweater project! I created this DIY sweater almost a year ago as an editorial contribution to a local fashion magazine. However, timing didn’t quite work out and in the end, it never got published and printed (it happens!). I was asked by the Fashion Editor to re-create a Celine sleeve-tied sweater that was seen on the runway last year. I was a little nervous about creating a version of my own that would be well-received by the every-day consumer since the Celine version was very ‘couture’ but I wanted to experiment anyway! The style of this DIY sweater is a bit tricky to pull off but when I completed the project, I was quite happy with the result! It is such a new twist to the average cape or knit sweater. I am also pleased (and a little surprised) to see that, this faux wrap sleeve style has been seen on skirts and worn by some fashionable icons recently! Though never published, I thought I’d take today to share with you my thoughts on experimenting with DIYs, achieving unexpected results, and also with the cooler months coming up, a DIY sweater to inspire you on creating your own, regardless of what style! So honestly, would you sport this trend style? Or rather stick to a good old fashion knit sweater? I’m headed out to NYC for the weekend, spending some much needed time with my BFFs! I hope you’ll enjoy your weekend and if you’re looking for more inspiration, but sure to visit more of my DIY Projects! I love how this came out! Very clever too, I thought it would be way more complicated than it actually was. oh my! I love the idea. And I think I’m gonna try it 🙂 So clever.